I'm the kind of gal who loves glitter and a rainbow of colors for Christmas. These wood snowflakes will stay up through winter, as a reminder than through the cold and snow awaits a beautiful Spring...albeit a rainy one. 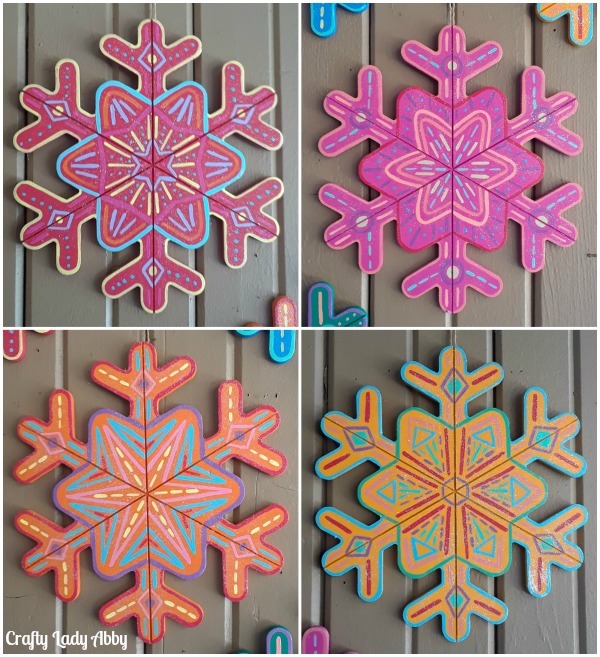 I used DecoArt Americana Acrylic, Craft Twinkles and Glamour Dust paints to turn unfinished wood snowflakes from Target into glittering rainbow decorations. I lost track of all the colors I used, but you can make these in any color palette you chose. 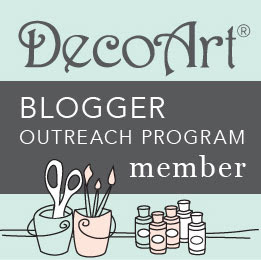 DecoArt provided me with their paints for this project. All thoughts, opinions, images, and the tutorial are my own. 1) Using a 1" wide flat paintbrush and your chosen paint colors, basecoat the snowflake tops and sides. Let dry fully. If the color looks patchy, paint a 2nd coat to achieve full opacity. For my basecoats, I used Watermelon Slice, Carousel Pink, Bright Orange, Saffron Yellow, Bluegrass Green, Ocean Blue, and Lavender. 2) With a liner paint brush and lighter colors, outline the inner snowflake star and snowflake arms. This can be any color combo you thinks good. I rarely have a color plan, so I just go with contrasts in color, tone and shade. 3) Still with the liner brush, using other colors, add different details following the snowflake's shape. Using simple lines, circles, curves, and dots makes for easy symmetry. Keep it simple! Make dots by dipping the handle into paint and then onto the snowflake. This keeps the dots fairly even. I've been told that a pencil eraser or small dowel rod makes nice big dots. Let this layer fully dry. Dots will take the longest to dry. 4) On the plate, mix even parts Craft Twinkles in Crystal and Glamour Dust Paint in Ice Crystal. Coat the snowflake tops with the glitter paint mixture. Mix more glitter paint as needed. Let the 1st layer dry. Give the snowflakes a 2nd coat. Let fully dry. If it's not your desired sparkle by 2 coats, then add a 3rd coat of the glitter mixture, or just use Craft Twinkles in Crystal, as it has larger glitter flakes. You might be thinking, "Why can't I use the colored glitter paints?". 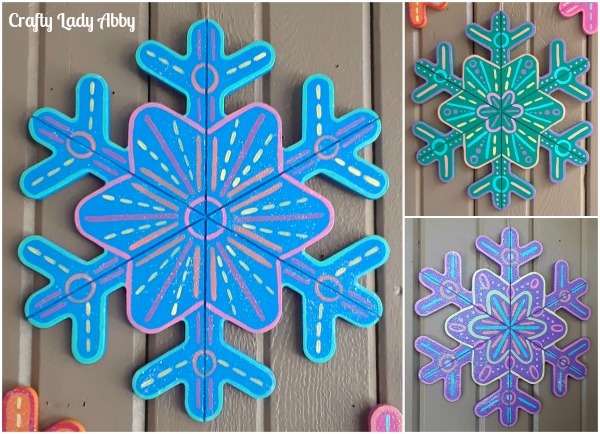 Since the snowflakes are multi-colored, a colored glitter paint will deposit both colored glitter and transparent base, toning the whole snowflake that color. The color glitters have more pigmented glitter flakes that can detract from the snowflake details. By using the two Crystal glitters, you get a soft glitter glow that doesn't detract from the details and keeps the colors popping. The Crystal glitters have transparent pastel flakes, that give a rainbow (not holographic) appearance that compliments the different colors on the snowflakes. I use a lot of glitters in my work, so trust that I have your glitter needs covered. 5) Cut 8" long twine pieces. You need one piece per snowflake. You can use baker's or jute twine. I used jute, because it blends into my house color better. Overhand knot the ends of each twine piece. 6) Lay the silicone craft mat on your work surface. Plug in the hot glue gun and set to high heat. Add a hot glue stick if needed. Squeeze a glob of hot glue on the back of a snowflake arm, towards the end. Press a knotted twine piece into the hot glue. I used scissors to poke the twine into the glue. Add more hot glue on top to encase the twine knot and tails. Let cool. 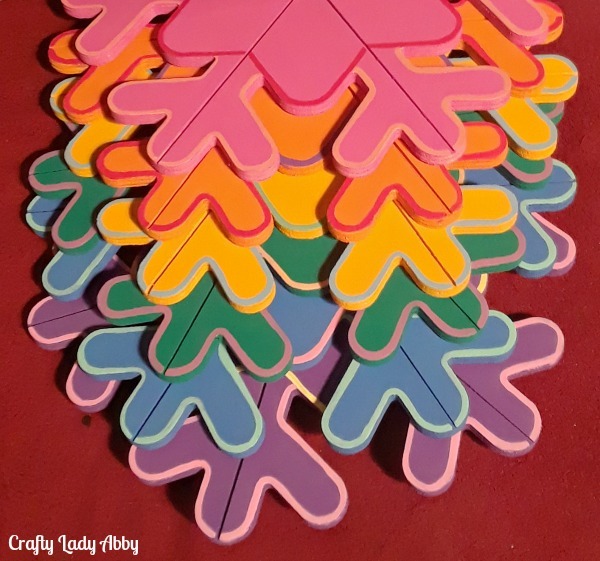 7) Layout your snowflakes in a desired pattern. I reused the holes from my Rainbow Glitter Pumpkins, as the snowflakes are about the same size. 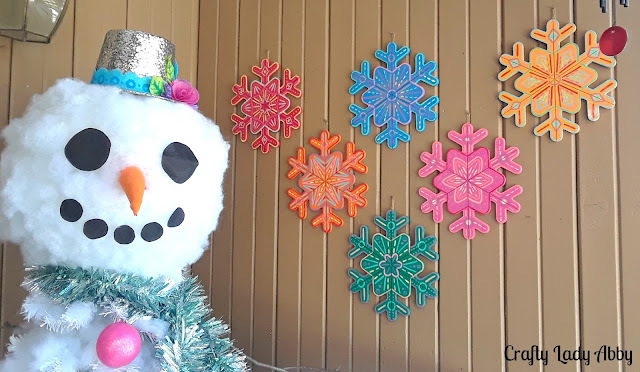 You'll notice a cheerful snowman beside these snowflakes. He's a Whimsical Snowman Christmas Tree that you can make yourself. You have a week until Christmas, so that's plenty of time to make him come alive. I promise he won't run off with your children. You can make all of these projects in any color scheme that suits your decor desires. They'd look great in traditional, dark, and neutral colors too. If my husband had a bigger say in our decor, we'd have a very dark and gothic home. Instead it's rather colorful and I save the black for my own wardrobe. Whatever you're making, have fun with it. Happy Holidays and Makery!